Includes QR code Previous edition: 2014. Text on inside cover. 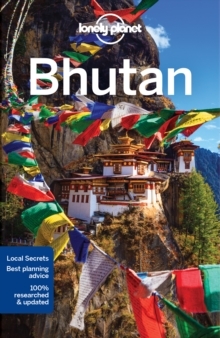 Lonely Planet Bhutan is your passport to the most relevant, up-to-date advice on what to see and skip, and what hidden discoveries await you. Join the pilgrims at colourful Changangkha Lhakhang, hike to the dramatic cliff -hanging Taktshang Goemba, or explore the busy weekend market at Thimpu; all with your trusted travel companion. Inside Lonely Planet Bhutan Travel Guide: Colour maps and images throughout Highlights and itineraries help you tailor your trip to your personal needs and interests Insider tips to save time and money and get around like a local, avoiding crowds and trouble spots Essential info at your fingertips - hours of operation, phone numbers, websites, transit tips, prices Honest reviews for all budgets - eating, sleeping, sight-seeing, going out, shopping, hidden gems that most guidebooks miss Cultural insights give you a richer, more rewarding travel experience - festivals, architecture, Buddhism, customs, wildlife, history, traditional arts Over 37 maps Covers Thimphu, Paro Dzongkhag, Trongsa Dzongkhag, Mongar Dzongkhag and more About Lonely Planet: Since 1973, Lonely Planet has become the world's leading travel media company with guidebooks to every destination, an award-winning website, mobile and digital travel products, and a dedicated traveller community.